Fourteen years after Jack Dundee made a game-losing fumble in Taft High’s best shot at beating their rivals from Bakersfield ever, he’s still obsessed by it. Nevermind that he’s vice president of a bank and married to the boss’s daughter, he’s so hung up on the moment he believes ended his future that he rewatches the moment on film frequently in his office, and regularly visits a shady massage place on the county line just to lie in bed and talk about his failure. One day he realizes he can organize a rematch to rewrite history and give himself the redemption he dreams of. Bakersfield agrees, but Taft, a small town with small resources and nothing to prove, is reluctant, as is his best friend, star quarterback Reno Hightower, who’s been stuck in Taft as a mechanic ever since his career-winning knee injury at the big game. With both men close to losing their wives, what they need is something to help them find themselves. I was expecting the focus of the story to be the game, but it’s much more about the runup to it. Not even that, it’s about the two guys dealing with life’s disappointments and trying to reclaim their marriages. Jack is stuck in the past emotionally and Reno is stuck in something more like physically. Reno doesn’t want to have anything to do with football anymore, but he’s so comfortable in Taft, which is pretty much a rathole, that he’d rather stay there than keep his marriage together. I’d judge the characters to be in their late 30s, but that’s ten years older than they ought to be, unless everybody got held back forever. (Jock joke omitted.) I’m not sure if I’m just off because the life of a 30something is so much different than the life of an early 20something (or at least this one) or if the creative team pushed it more toward middle age because that was what they knew better. I really enjoyed the supporting cast. “The Colonel”, Jack’s boss/father-in-law and Bakersfield supporter was fun to watch, and it’s always nice to see M. Emmet Walsh, who here plays the leader of the Caribous, who get a fun scene. One annoyance was that the omnipresent fight song of Taft High is for some reason Pomp and Circumstance. It might just be me, but if you ever got sick of it after it looped for forty minutes as a graduation processional, you may find it a bit grating when it pops up constantly in the film, including as a doorbell chime. I’m not a big sports fan, but when I decide to watch a sports movie, I like more sports in it. Not that I didn’t enjoy what it was, but what it was was barely a movie about football. This is a movie about talking about football. It’s fun in its way, but I’d rather watch… well, I’m trying to think of something like Cool Runnings but with football, but I can’t. 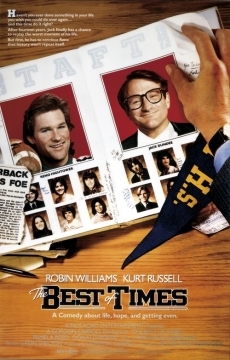 Watch this movie: to gain perspective on how good your high school experience really was or wasn’t. Don’t watch this movie: to see middle-aged men shatter bones like glass on the field for 90 minutes.